Cibeles Palace and Fountain – The statue of Cybele driving a chariot pulled by lions has become symbolic of Madrid. 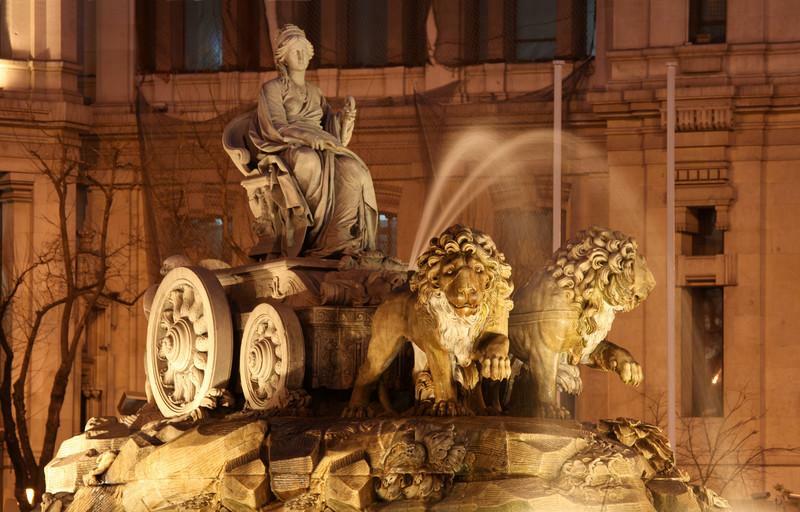 The fountain sits in the traffic circle in front of the Cibeles Palace, which is now the city hall. 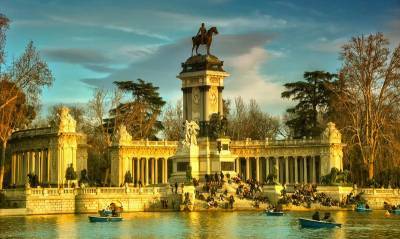 Retiro Park – this public park is massive. It includes a lake, the Crystal Palace and the Royal Observatory. Also adjoining the park, near the museums is the Royal Botanic Garden. Puerta de Alcalá – the old city gate borders the park. Golden Triangle of Art – the Prado Museum with Flemish and Spanish paintings; the Reina Sofia Museum featuring Picasso and Dali; the Thyssen-Bornemisza Museum focuses on Old Masters and 20th century paintings. Gran Vía – 20th century architecture along Madrid’s most famous street, which roughly joins the Retiro area with the Royal Palace. 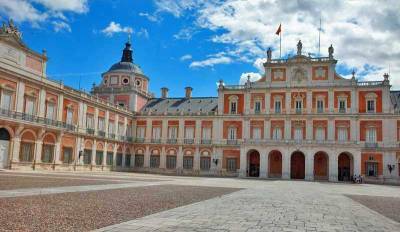 Royal Palace of Madrid – built by French born Philip V in the 1700s. This Spanish version of Versailles has over 2,000 rooms. The Madrid Cathedral, Plaza de Oriente Royal Armory and Sabatini Gardens are here too. The Royal Theatre with its restored 1850 Opera House is opposite the palace. Beside the palace is the Royal Convent of La Encarnación where a phial of blood from Saint Pantaleón (300 BC) is held. The southern palace grounds contain the Arab Wall with ruins from the Moors. 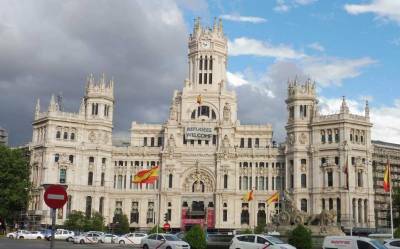 Take the Teléferico de Madrid Cable Car to Campo del Moro to reach the Zoo Aquarium de Madrid and the Madrid Amusement Park. 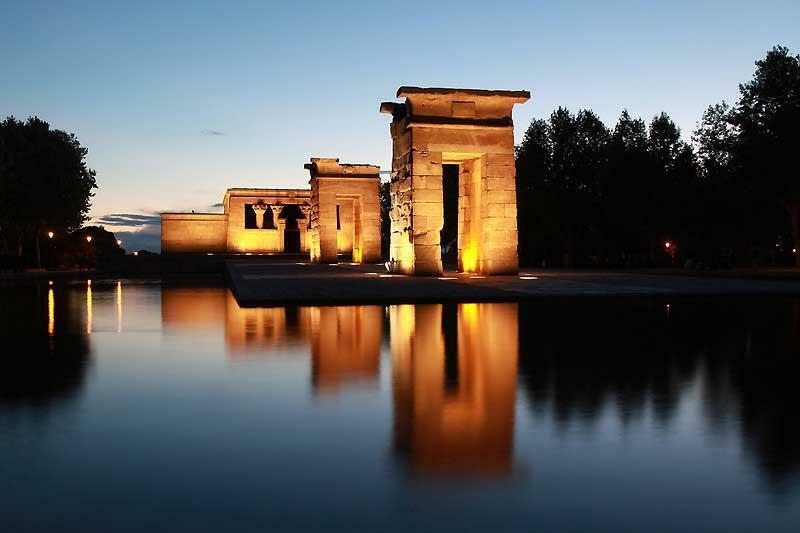 Temple of Debod – 2nd Century BC Egyptian temple donated in 1968 by Egypt in recognition of support in saving temples in Nubia. Watch the sunrise over Madrid and enjoy views of Plaza de la Armería and San Francisco el Grande. Plaza España – a monument to Cervantes and his two most important characters, Don Quixote and Sancho Panza. Vistillas Gardens – botanical gardens and sunset views. The gardens are close to the modern viaduct over Calle Segovia. 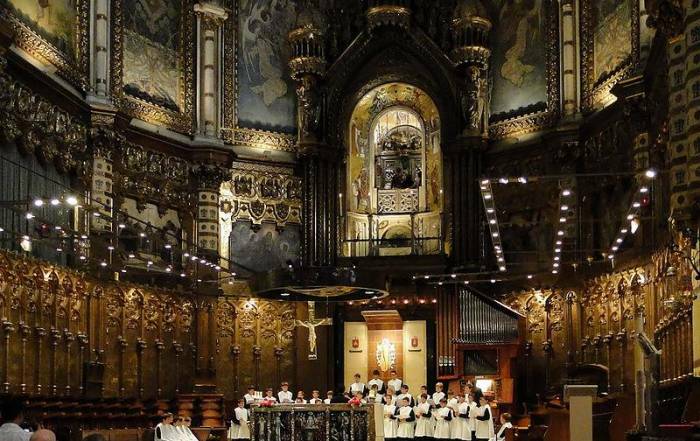 Travel a half hour to the Monastery of El Escorial. 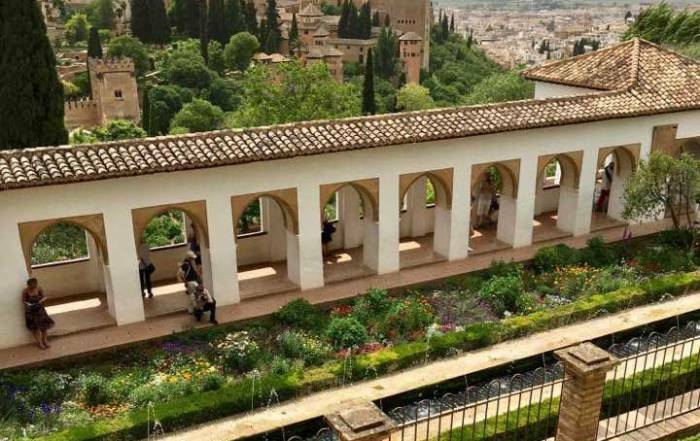 Centuries on Spanish Kings and Queens are buried at this elaborate palace built by King Phillip II. On the way there, visit the Valley of the Fallen, commemorating the 1 million Spaniards who lost their lives in the Spanish Civil War in the late 1930s. 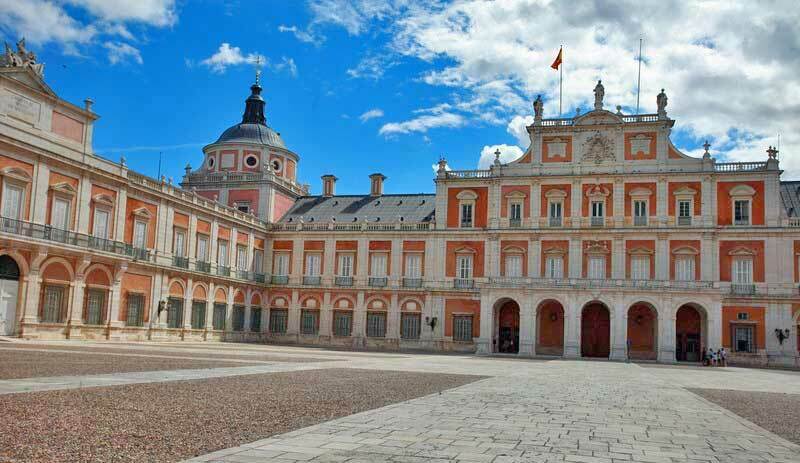 Travel an hour south to the Royal Palace of Aranjuez. 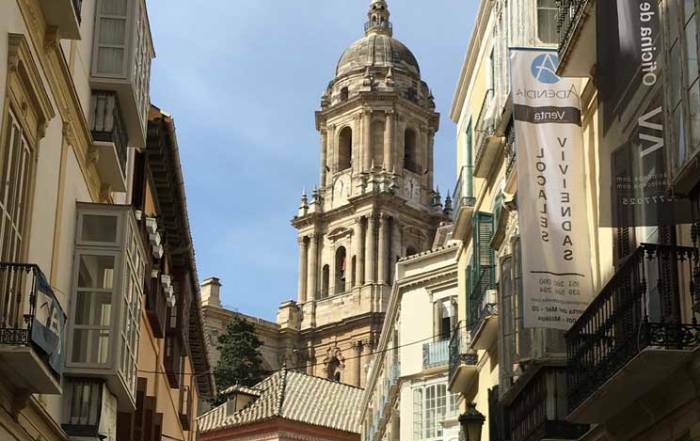 Take a day trip to Toledo. Plaza Mayor – enjoy local food and drink at the central plaza of Madrid. 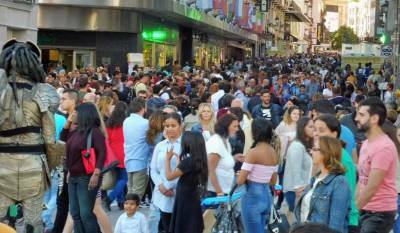 El Rastro Market – Madrid’s Sunday flea market is the largest in Europe. Plaza de la Puerta del Sol – a central transit hub and gathering place. The Real Casa de Correos faces the square and its clock brings in each new year with each ring being sufficiently spaced for the crowds to swallow a grape after each chime. Market of San Miguel – covered market near the Plaza Mayor. Plaza de la Villa – beautiful historic architecture on this square a block west of the Plaza Mayor. Restaurante Botin (El Sobrino de Botín), which the Guinness Book of Records quotes as the oldest restaurant in the world. Watch flamenco dancing while you dine. Plaza de Toros de Las Ventas – See a bullfight. Santiago Bernabeu Stadium – watch Real Madrid play soccer (football). 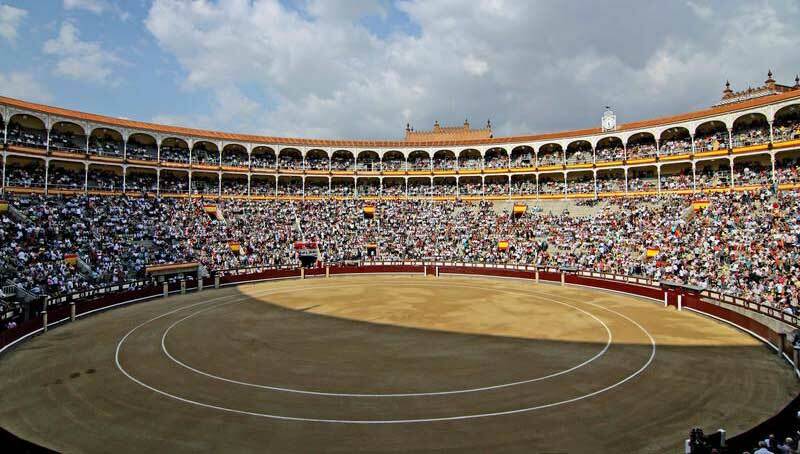 Botellon – drink wine in the public plazas in the early evening on weekends. Visit Tapas Street (Calle Cava Baja) southwest of the Plaza Mayor. Eat pigs ears, squid sandwiches and Cocido Madrileño Stew – Madrid’s specialty. Consider a Tapas Night Walking Tour. The Museum of Ham (Museo de Jamón) – Don’t just look at it the displays, eat them too. Casa de las Torrijas for sweet bread pudding and pastries. San Gines Chocolateria for chocolate. National Archaeological Museum of Spain – including the Lady of Elche limestone bust from the 4th Century BC. CaixaForum – modern art gallery with a unique vertical garden. Casa Museo Lope de Vega – museum in tribute to Spain’s greatest playwright. Museo de la Real Academia de Bellas Artes de San Fernando – Picasso and Dali studied at this academy. Goya Museum – for the frescos. Madrid-Barajas Airport (MAD) is the busiest airport in Spain. The Madrid airport is in the city limits. A 24 hour express bus and commuter train connect the airport to the downtown area. The Cibeles Palace area is about a 30 minute cab ride from the airport. The Madrid Metro is extensive and the RENFE rail system is an excellent to get around. Spain is aggressively building high speed access to Madrid from every corner of the country. The two main terminals for rail are Chamartín in the north end of the city and Atocha in the south. Nearly all of the many things to see and do in Madrid are located downtown in three general areas: the Royal Palace, the Plaza Mayor and Retiro Park. These areas are 30 minutes apart or less when walking or take Hop On Hop Off bus tour. In the months of July and August, Madrid weather can be extremely hot. So late spring and early fall offer the best Madrid weather temperatures. Average highs in July and August are 90 F (32 C), while average lows in summer are 65 F (18 C). In the winter months from December to February, average highs are 52 F (11 C), while average lows are 37 F (3 C). Rainfall is lightest in the summer months and heaviest in the fall. Spring and fall are likely the best times to visit Madrid. Madrid is the capital of Spain and its largest city. More than 6 million people live here. Madrid is located along the Manzanares River in almost exactly the center of Spain. In the 600s the Muslim Moors took over the city. 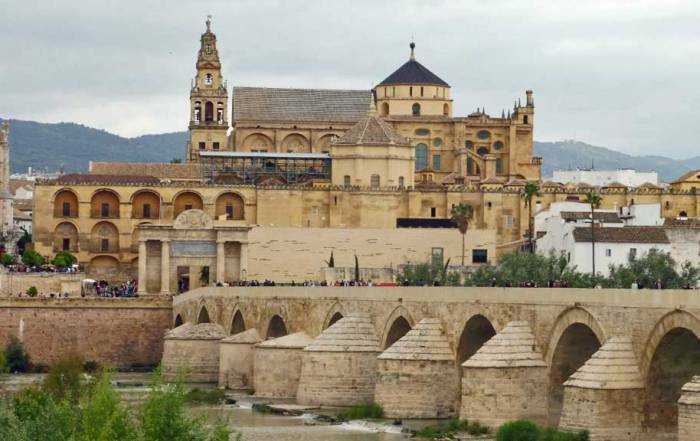 The Christians took control of the city in 1085. 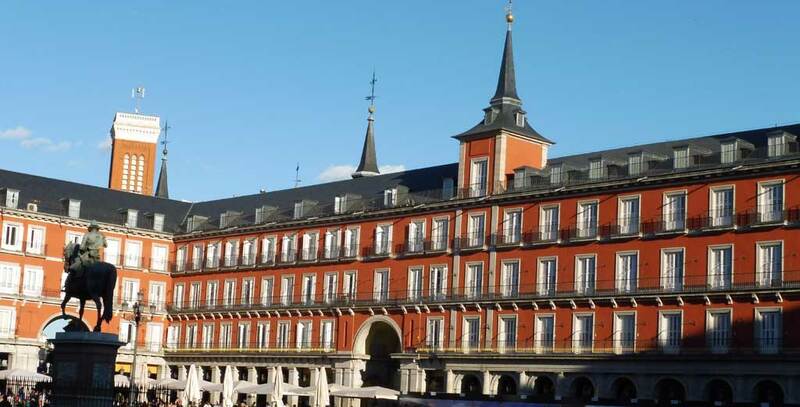 The kings and queens of Spain invested heavily in Madrid, giving it a rich heritage. 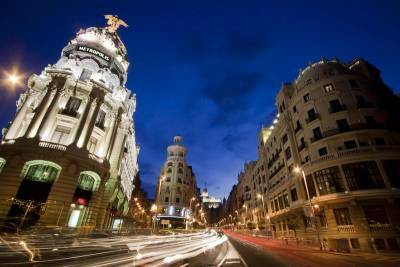 Madrid is one of the most popular cities for tourism in Europe. In the downtown core, one of the distinctive features is the large number of parks and also their large size. Visitors should be prepared for a country that is extremely proud of its heritage and language. English will not be as commonly spoken as in other areas of Europe.